A UN convoy of humanitarian aid has reached Kachin war refugees in the conflict-affected areas, marking the second time the Burmese government has allowed the United Nations to access Kachin rebel-controlled regions since June last year. The four trucks and two UN vehicles arrived in Sadang, a township under the control of the the Kachin Independence Organization (KIO), from the government-controlled town of Myitkyina on March 24. The last aid allowed into the area was in December. 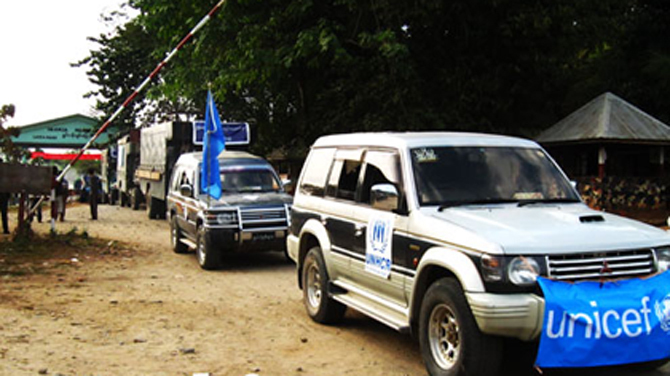 “We now need to make these convoys a regular occurrence,” UN Resident and Humanitarian Coordinator Ashok Nigam told the UN’s relief news station, Integrated Regional Information Network (IRIN), in Rangoon. Food assistance for more than 1,000 people for one month is being provided, along with a variety of non-food items ahead of the upcoming monsoon season in May, according to the IRIN. “This is a major step forward and follows sustained advocacy on the part of the UN with both the government and the Kachin Independence Organization,” Nigam was quoted as saying. More than 60,000 people—20,000 in government-controlled areas and up to 40,000 in KIO-controlled areas—have been displaced by the hostilities. Also, several thousand others are believed to be in China staying with relatives or host families. The KIO released a statement on Mar. 24 saying that fighting has also escalated in KIO-controlled areas of Kachin State and in northern Shan State, and that the Burmese army has sent more troops into the conflict zone. The KIO said that no tangible peace agreement has been agreed between the government peace team and the KIO leaders despite meeting several times. The UN and international agencies have had regular access to Kachin refugees in government-controlled areas, but not in KIO-controlled areas, leaving the latter largely dependent on charity groups and local authorities. Major needs identified included emergency supplies, water and sanitation, food, medical assistance and education materials. Food insecurity is also likely to prevail until at least the end of 2013 since many refugees and IDPs left their farms and lost their harvests, and longer-term assistance will be needed to rebuild lives in their areas of origin. UN wants to make convoys of trucks loaded food and humanitairin supplies. At the same time UN should try to make peace effort in the conflicted areas so that all Kachin refugees can go back their villiges before monsoon. Welcome UN aids, but what we really need is to take out the root of civil wars. Shame on the govt that only incline to foreign pressure(perhaps foreign teachers for them) instead of domestic pressure (demands of ethnic groups). It seems that the needs of people in Myamar have to be interpreted by international bodies and convey it as pressure Burmese govt. come on, our govt, be self-determined for welbeing of your own people.